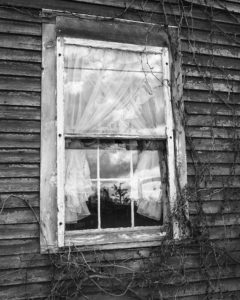 “Ruby’s Place” is a black and white photograph of a window in an elderly Maine woman’s house. The weathered shingled siding is across from a small town cemetery—as can be seen in the reflection in the glass-and you are possibly wondering what the occupant of the house thinks as she looks out her window. Technically I used a Mamiya 645, Kodak PX 125 film, shot at f8/125 sec.